The Police and Fire Retirement System (PFRS) covers more than 35,000 police officers and firefighters across New York State. As a PFRS member, you’ll pass a series of important milestones throughout your career. Knowing and understanding these milestones will help you better plan for your financial future. Some milestones are common to most Police and Fire members; others are shared by members in a particular tier. For example, Tier 2 and 3 members must have five years of service credit to be vested (eligible for a pension benefit), while Tier 5 and 6 members need 10 years. Most PFRS members are in special plans that allow them to retire with full benefits, regardless of age, after 20 or 25 years of service. Your specific milestones, along with your pension calculation, are determined by your retirement plan, so it is important for you to familiarize yourself with the details of your own plan. You can find plan information on our Publications page. Not sure which one is yours? Your retirement plan is listed on your Member Annual Statement, which is provided to you each summer, or you can ask your employer. Content last revised May 2, 2018. This entry was posted in General News and tagged 20 and 25 year plans, member milestones, Membership Milestones, New York State & Local Retirement System, NYSLRS, PFRS, Police and Fire, police and fire retirement system, retirement eligibility, Special Plans, tier, vesting on May 2, 2018 by NYSLRS. Knowing your member milestones can help you plan ahead for your retirement. Most Employees’ Retirement System (ERS) Tier 3 and Tier 4 members (unless they retire under special retirement plans) retire under the Article 15 retirement plan. If you’re covered by this retirement plan, you have a set of milestones that affects how your pension benefit is calculated. This also means it affects how much you’ll receive at retirement. You are eligible to retire once you are age 55 and have five years of service credit. There may be reductions to your benefit if certain age requirements aren’t met. You can retire with full benefits at age 62. However, if you are age 55 or older with 30 or more years of service credit, you can also retire with full benefits. If you retire with less than 20 years of service credit, your benefit equals 1.66 percent of your final average salary (FAS) for each year of service. If you retire and have 20 to 30 years of service credit, the benefit is 2 percent of your FAS for each year of service. If you retire with more than 30 years of service credit, the benefit is 2 percent of your FAS for each year of service up to 30. For each year beyond 30, you will receive 1.5 percent of your FAS. Please visit our website for more information about ERS member milestones and retirement plans. Content last revised February 10, 2016. 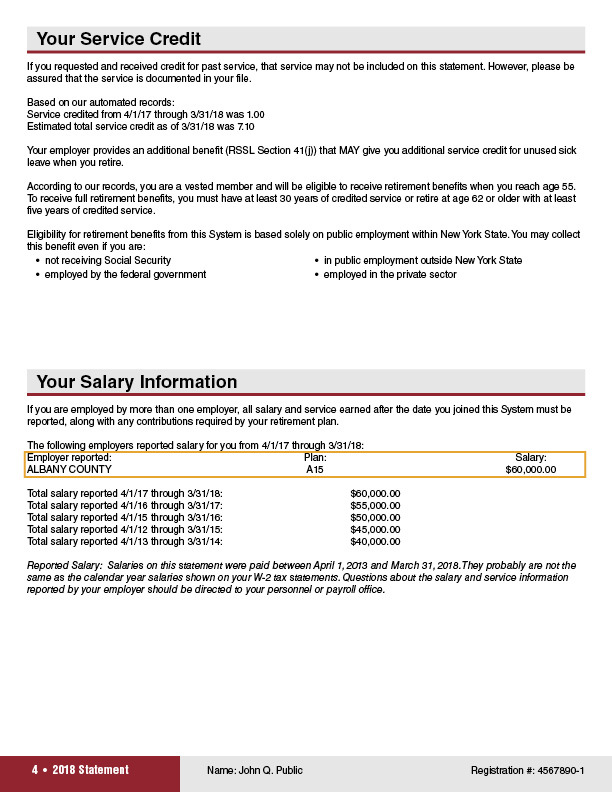 This entry was posted in General News, Members and tagged benefit reductions, death benefit, defined benefit plan, ERS, ERS Tier 3, ERS Tier 4, Final average salary, Information is the Key, know your benefits, members, Membership Milestones, New Members, New York State & Local Retirement System, NYSLRS, Preparing to Retire, retirement age, Retirement Milestones, retirement plan, retirement planning, Service credit, tier, Vested, vesting on February 10, 2016 by NYSLRS. As a NYSLRS member, you have a defined-benefit retirement plan that provides a lifetime pension when you retire. Laws passed by the Legislature and signed by the Governor have established the formulas used to calculate these benefits. Your specific benefit will be based on two main factors: service credit and final average salary. 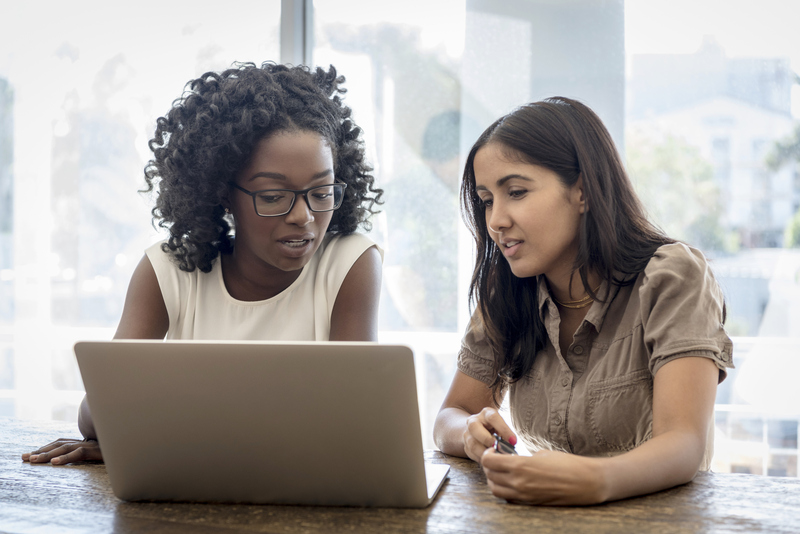 You’re probably familiar with service credit — it’s generally the years of service you’ve spent working for a participating employer. 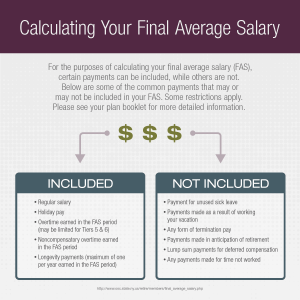 But, what is a final average salary (FAS)? When we calculate your pension, we find the set of years (one, three or five, depending on your tier and retirement plan) when your earnings were highest. The average of these earnings is your FAS. Usually your FAS is based on the years right before retirement, but they can come anytime in your career. In fact, the years used to calculate your FAS may not match up to a calendar year or even a fiscal year. For FAS purposes, a “year” is any period during which you earned one full-time year of service credit. Three-year FAS: Members in Tier 1, 2, 3, 4, and 5. Five-year FAS: Members in Tier 6. 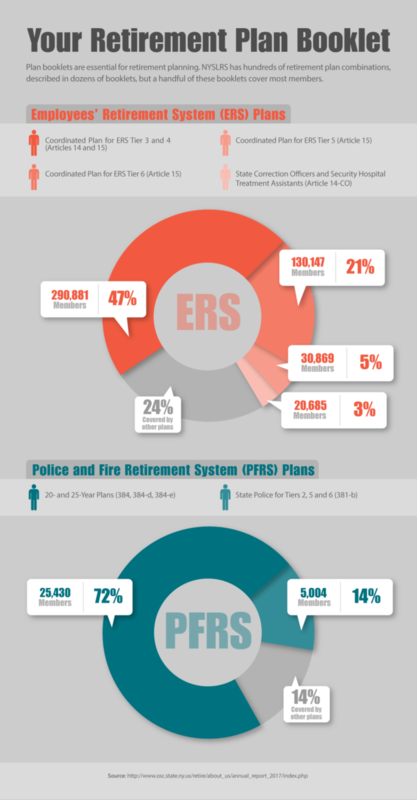 One-year FAS: Members in the Police and Fire Retirement System (PFRS). Your employer must choose to offer this benefit. It’s not available to PFRS members covered by Article 14 and generally not available to PFRS Tier 6 members. The law limits the FAS of all members who joined on or after June 17, 1971. For example, for most members, if your earnings increase significantly through the years used in your FAS, some of those earnings may not be used toward your pension. The specific limits vary by tier; check out your retirement plan booklet on our Publications page for details. Overtime pay is capped — $18,448.11 in calendar year 2017 and $19,001.55 in 2018. Overtime pay is capped — $15,721 in fiscal year 2017 and $16,048 in 2018. Lump sum vacation pay and wages from more than two employers are no longer included in your FAS. Any earnings beyond the Governor’s salary — currently $179,000 — are left out of your FAS. 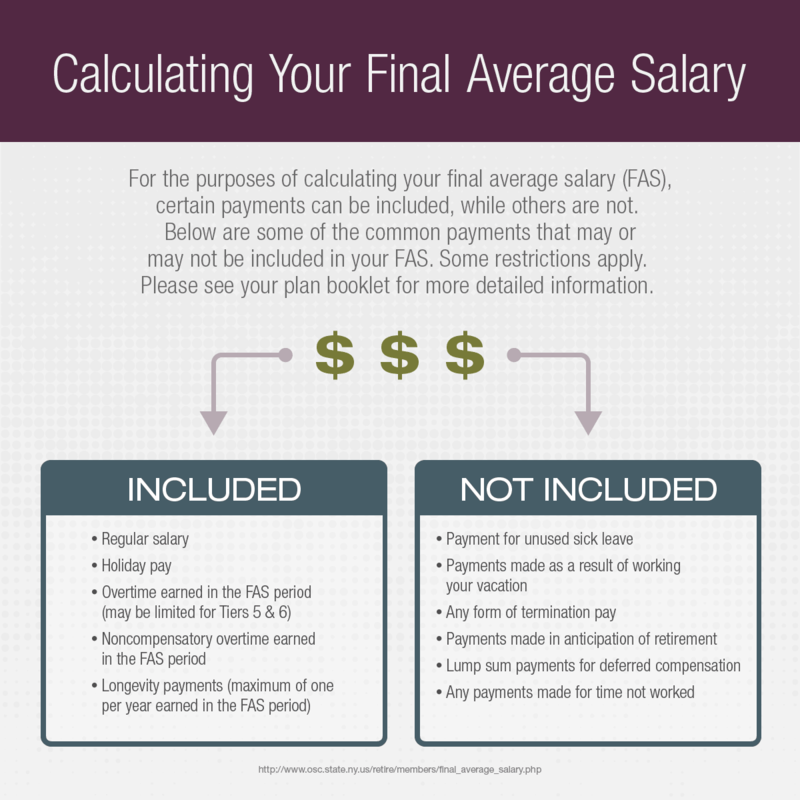 Find out more about how FAS are calculated on our website. Want to read more NYSLRS Basics? Check out our posts on when you can retire and choosing your pension payment option. Content last revised September 27, 2017. This entry was posted in General News, Members, Pension System and tagged calculation, defined benefit plan, defined benefit plans, ERS, FAS, Final average salary, New York State & Local Retirement System, NYSLRS Basics, pension, pension payment option, PFRS, Preparing to Retire, public pension system, retirement age, retirement plan, retirement planning, Service credit, tier, Vested, vesting on December 16, 2015 by NYSLRS. NYSLRS Basics: When Can You Retire? There are core elements behind each NYSLRS retirement plan that every member should know. Knowing your retirement plan details like what your pension payment options are and how your final average salary (FAS) works is essential. Learning these NYSLRS Basics can give you a good foundation of information and help you prepare for retirement. This is a popular question we hear from members. Because of the large number of retirement plans we manage, there isn’t one single answer to this question, but we do have answers. Note: service credit is defined as the credit you receive for your paid public employment with a NYSLRS participating employer. If you’re in a special retirement plan (most police officers, firefighters, sheriffs and correction officers are in special plans), you can retire at any age as long as you’ve met the service credit requirement for that plan. Special plan members can retire once they reach 20 or 25 years of service credit, whichever their plan requires. Keep in mind that even though you could retire as early as 55, you may receive a benefit reduction* for not waiting until the full retirement age. (Visit our Early Age Reduction page to see the reductions for your tier.) Under NYSLRS regular retirement plans, you can retire with no reduction once you reach your full retirement age. It’s important to know that if you decide to retire with a reduced benefit, the reduction is permanent – it doesn’t end once you reach your full retirement age. Keep this in mind once you start preparing for retirement. Knowing what your full retirement age is and when you’re first eligible to retire is just one part of the NYSLRS Basics series. Look out for a future post on retirement option selection. *There are some exceptions: Tier 1 members can retire at age 55 without a benefit reduction; ERS Tier 2, 3 & 4 members and Tier 5 Uniformed Court Officers and Peace Officers employed by the Unified Court System can retire at age 55 with 30 or more years of service credit without a benefit reduction. Content last revised October 28, 2015. This entry was posted in General News, Members and tagged defined benefit plan, early age reduction, ERS, FAS, Final average salary, full retirement age, Information is the Key, members, New York State & Local Retirement System, NYSLRS, NYSLRS Basics, PFRS, Preparing to Retire, regular retirement plan, retirement, retirement age, retirement planning, Retiring at Age 55, Service credit, special retirement plan, tier, Vested on October 28, 2015 by NYSLRS. When you join the New York State and Local Retirement System (NYSLRS), you’re assigned a tier based on the date of your membership. There are six tiers in the Employees’ Retirement System (ERS) and five in the Police and Fire Retirement System (PFRS). Each tier has a different benefit structure established by New York State legislation. Our series, NYSLRS – One Tier at a Time, walks through each tier to give you a quick look at the benefits in both ERS and PFRS. Today’s post looks at ERS Tier 6, which includes anyone who joined ERS since April 1, 2012. There were 166,532 ERS Tier 6 members as of March 31, 2017, making them the second largest tier group in ERS. 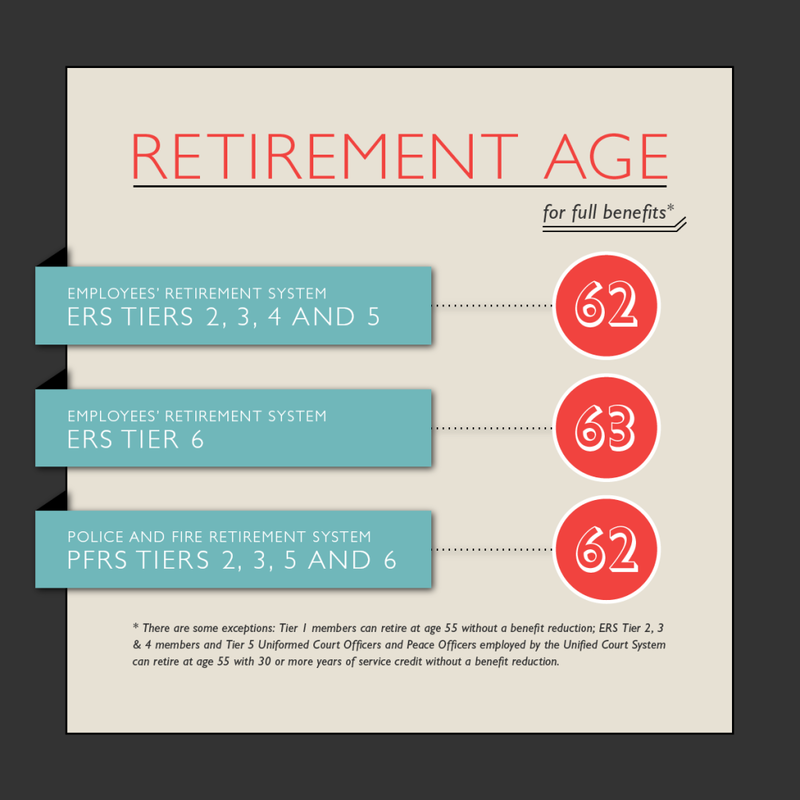 The graphic below illustrates basic retirement information for Tier 6 members. For benefit information about special plans for other job titles, please visit our Publications page. Content last revised November 28, 2017. This entry was posted in General News, Members and tagged benefit reductions, benefits, ERS, FAS, Final average salary, Information is the Key, know your benefits, member contributions, members, New Members, New York State & Local Retirement System, NYSLRS, Preparing to Retire, retirement age, retirement plan, Service credit, sick leave credit, tier, Tier 6, vesting on September 16, 2015 by NYSLRS. Today’s post looks at Tier 6 in the Police and Fire Retirement System. Anyone who joined PFRS on or after April 1, 2012 is in Tier 6. PFRS Tier 6 members currently make up 21.3 percent of NYSLRS’ total membership, totaling 7,494 members, making it the second largest tier in PFRS. 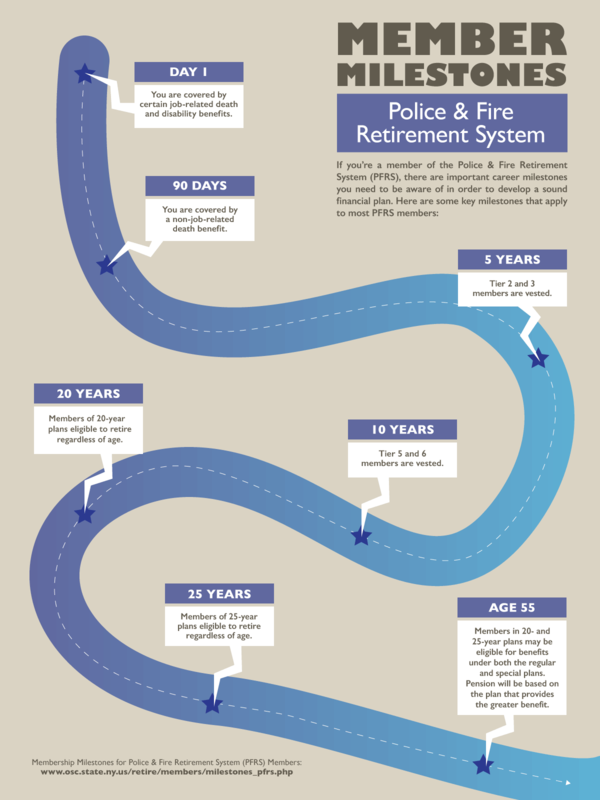 Check out the graphic below for the basic retirement information for PFRS Tier 6 members. Please visit our Publications page for special plans under miscellaneous titles. Content last revised March 12, 2018. This entry was posted in General News, Members and tagged benefit reductions, defined benefit plan, FAS, Final average salary, Information is the Key, know your benefits, members, New York State & Local Retirement System, NYSLRS, NYSLRS Retirees, PFRS, Police & Fire, retirement age, retirement plan, Service credit, sick leave credit, tier, Tier 6, vesting on April 29, 2015 by NYSLRS. When you joined the New York State and Local Retirement System (NYSLRS), you were assigned a tier based on the date of your membership. There are six tiers in the Employees’ Retirement System (ERS) and five in the Police and Fire Retirement System (PFRS). Each tier has a different benefit structure established by State Law. Today’s post looks at ERS Tier 5, which covers ERS members who joined from January 1, 2010 through March 31, 2012. As of March 31, 2016 there were 53,123 ERS Tier 5 members — 8.7 percent of NYSLRS’ total membership. 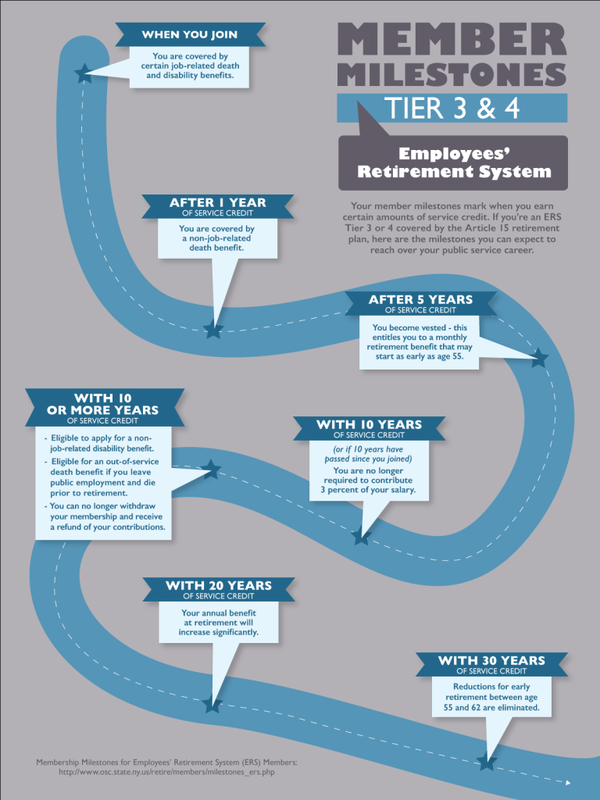 The graphic below illustrates basic retirement information for Tier 5 members. For benefit information about special plans for miscellaneous titles, please visit our publications page. Content last revised September 12, 2017. This entry was posted in General News, Members and tagged benefit reductions, ERS, FAS, Final average salary, Information is the Key, know your benefits, members, New York State & Local Retirement System, NYSLRS, One Tier at a Time, retirement age, retirement plan, retirement planning, Service credit, sick leave credit, tier, Tier 5, vesting on March 11, 2015 by NYSLRS.